The heart-stopping story of the first black regiment to fight for the North in the Civil War, Glory stars Matthew Broderick, Denzel Washington, Cary Elwes and Morgan Freeman. Broderick and Elwes are the idealistic young Bostonians who lead the regiment; Freeman is the inspirational sergeant who unites the troops; and Denzel Washington, in an Oscar® - winning performance (1989, Best Supporting Actor), is the runaway slave who embodies the indomitable spirit of the 54th Regiment of Massachusetts. $63.661 thousand on 3 screens. Although he first made his name through the decidedly modest scale of TV’s thirtysomething, director Ed Zwick now seems to specialize in larger-than-life, heroic films. His movies work as long as Denzel Washington appears in them. Both 1996’s Courage Under Fire and 1998’s The Siege fared much better than they should. On the other hand, flicks like 1994’s Legends of the Fall, 2003’s The Last Samurai, 2006’s Blood Diamond and 2008’s Defiance range from mediocre to bad. Into the “success” category falls 1989’s Glory. A film that views the Civil War from an unusual perspective, it provides a moving and compelling look at Zwick’s usual topics of bravery and freedom and does so in a passionate and entertaining manner. Glory focuses upon the 54th Regiment of Massachusetts, one of the first all-black units former during the Civil War. Headed by white Colonel Shaw (Matthew Broderick), this group joins the cause with passion and becomes a strong, disciplined fighting unit. The film covers their experiences, both positive and negative. Among the soldiers, Glory mainly concentrates on a few different characters. There’s older, wiser Rawlins (Morgan Freeman), educated free-man Searles (Andre Braugher), stuttering, innocent, and apparently less-than-brilliant Sharts (Jihmi Kennedy), and fiery, cynical Trip (Washington). To say that these roles are little more than stereotypes would be very accurate; we’ve seen these sorts of characters before, and little about the ways in which they’re written makes them stand out from the pack. However, the cast helps elevate the predictable characterizations to a much more compelling level. Washington won an Oscar for his work as Trip, and it’s easy to see why as you watch Glory. Washington feels natural and real in the role; he’s able to show the character’s lack of education without making him seem dumb or ignorant. He also develops the role in a clear manner that depicts true, believable growth. It’s a solid performance from an actor who deserves all the accolades he’s received. I’m completely in the bag for Freeman, and while Rawlins doesn’t represent his absolute best work - I still think Se7en is his finest hour - Glory displays his marvelous talent to good effect. In some ways, Rawlins is similar to Freeman’s other 1989 role, that of Hoke, the faithful chauffeur in Driving Miss Daisy; he’s another character who displays quiet strength and pride without the overt anger of other folks like Trip. It’s to Freeman’s credit that although he could play such a role in his sleep, he doesn’t just mail in his performance. Freeman takes the sketchy material and creates a full-blooded character. It’s clear that the story doesn’t love Rawlins in the same way it adores Trip, but Freeman nonetheless does a fine job. The remainder of the supporting cast also seems excellent. As for Broderick, he’s received quite a lot of criticism over the years for his somewhat squirrely performance as Shaw. Folks have picked on his shakiness in front of the camera and his apparent lack of strength and composure in the film’s battle scenes. Frankly, I think the criticisms are off base. When Broderick appears quivery, it fits the story. At the film’s start, we see that Shaw’s been rattled in battle, and he’s not going to be gung-ho and stolid in combat. Broderick manages appropriate levels of strength and conviction in other scenes, such as one good segment in which he harasses his soldiers when they start to view warfare as fun and games. Broderick’s New England accept was extremely erratic and unconvincing - it’s a “now you hear it, now you don’t” affair - but I otherwise thought he provided a surprisingly solid performance. Zwick is an emotional filmmaker who wears his heart on his sleeve. While this tendency can result in over-emotive claptrap like Legends of the Fall, for the most part his work has been moving and rousing. Such was the case with his first theatrical drama, 1989’s Glory. Some will fault the film for its historical liberties - Civil War buffs hate even the smallest inaccuracies - but in this case, the message overrules the minor flaws. Glory tells an important story and does it well. Glory appears in an aspect ratio of approximately 1.85:1 on this Blu-ray Disc. All in all, I found the image to be extremely pleasing, as the movie looked clearer and more attractive than I expected. Sharpness seemed pretty good. A few shots looked just a bit soft, but those weren’t a concern. Instead, the majority of the movie demonstrated nice delineation. I noticed no issues with jagged edges or shimmering, and edge enhancement appeared to be absent. As for source flaws, they failed to mar the presentation. Grain stayed within normal levels, and this was a clean transfer. Colors appeared nicely accurate and vivid. The film featured a natural and pleasing palette, and the disc reproduced these hues well. From the rich blues of the uniforms to the reds seen in flags and other components, all tones looked rich and bold. Black levels also were deep and strong, and shadow detail appeared appropriately heavy but never excessively opaque. I felt impressed by this presentation. Also satisfying was the movie’s Dolby Digital TrueHD 5.1 soundtrack. The soundfield seemed surprisingly broad and engaging. The forward channels offered a wide and involving experience that spread sounds neatly and created a realistic auditory environment. The sound blended together well and appeared convincing. Surrounds kicked in with lots of useful audio that reinforced the forward speakers to great effect. James Horner’s score was bolstered nicely by the rear channels, and I also heard very positive use of various effects. From quieter ambient sounds like those heard in the mess hall to more vivid effects such as warfare or thunder storms, these scenes came across with a natural and convincing presence that was much better than I expected from a 1989 release. Audio quality was good. Speech could be a slight bit edgy at times, but the lines were usually acceptably concise and natural. Effects also betrayed a little distortion on occasion, but not to a distracting degree. Instead, those elements normally seemed accurate and full; battle scenes boasted good impact and bass. Music consistently seemed strong. The score appeared clear and bright without any of the distortion concerns that affected the rest of the track. The music was deep and rich, and it offered a satisfying experience. I thought this soundtrack held up well after 20 years. Most of the extras from the prior Special Edition DVD repeat here. We open with an audio commentary from director Edward Zwick. He provides a running, screen-specific chat that looks at research and historical elements, cast, characters and performances, sets and locations, recreating battles, music, cinematography and visual design, and a few other production topics. Zwick provides a good overview of the film. He touches on a nice mix of subjects and develops most of them well. I’d like to know more about the apparent discord between Matthew Broderick and Cary Elwes, but even without that dirt, this is a nice chat. For something exclusive to the Blu-ray, we head to the Virtual Civil War Battlefield. This displays a map and always you to select Civil War-related subjects based on geography. We get more info about the 54th as well as biographies and specifics about battles. Most of these details come to us via windows with text and photos, but a few “Video Journals” also appear. These accompany “Gettysburg” (2:59), “Antietam” (1:44), “Lincoln Elected” (1:07), “Emancipation” (1:25), “First Bull Run” (1:02), “Chancellorsville” (1:55), “General Lee Bio” (1:03), “Columbia” (1:15), “Fort Sumter” (2:24), “Fort Henry” (1:31), “Fort Donelson” (1:41), and “Shiloh” (0:28). During the clips, we hear from author/Civil War historian Dr. Roger Ransom and Pepperdine University Professor of History Dr. Stewart Davenport. The brevity of the snippets means they’re not especially detailed, but they’re still informative. Overall, the “Battlefield” becomes a moderately interesting way to learn a little more about the Civil War. One complaint: I’d like to have an option to go through the “Battlefield” segments in chronological order. Since we examine them geographically, our understanding of the war’s development becomes disjointed. There’s no coherence to the chronology here, so it’s more difficult to follow the material. 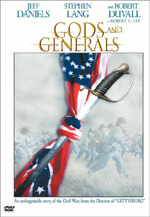 Most prominent among the remaining features is The True Story of Glory Continues, an oddly titled but generally interesting 45-minute and 18-second documentary. 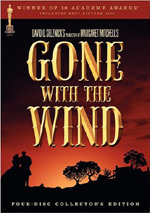 Narrated by Morgan Freeman, this show details some of the events covered in the film but - as implied by the title - goes past the movie’s ending to offer additional facts. Actually, even the portions that focus on the flick’s storyline include new data, since the film took some liberties with history; the documentary apparently sticks more closely to reality. “The True Story” uses a combination of photos and art from the period plus footage of Civil War re-enactors to tell its tale. The latter add a nice element of visual flair to the show. While I found “The True Story” to be a little dry at times, it nonetheless provides a good look at the subject. Voices of Glory takes another look at some of the actual soldiers from the 54th Regiment. Narrated by Georg Stanford Brown, this program includes interview snippets with historian James O. Horton and also offers excerpts from letters written by the soldiers; these are read by three different actors including Sean Patrick Thomas of the hit Save the Last Dance. The 11-minute and 18-second piece focuses mainly on the pay issue covered in the movie, though a few other topics are discussed as well. Some of the actors over-emote, but it’s a compelling program anyway. We also find an Original Featurette. This piece comes from the time of the film’s theatrical release and it lasts seven minutes, 36 seconds. Since the movie is Glory, it’s appropriate we get a “glorler”: a glorified trailer. Actually, it’s a little better than most, as it combines some interview snippets with film clips and shots from the set, but it’s clearly promotional in nature and doesn’t offer a lot of information. Glory includes two Deleted Scenes. “The Apple Picker” (3:03) focuses on Trip, Rawlins and Sharts as they encounter their first scent of death, while “Crisis of Conscience” (2:35) looks at a chat between Shaw and his compatriot, Major Forbes (Cary Elwes). Both are interesting - though the second is a little lame - but both were also redundant and needed to be cut. In an optional commentary track, director Zwick discusses the scenes and the reasons for their omission. A few ads appear in the Previews domain. We get promos for The Da Vinci Code, The Patriot, Black Hawk Down, Air Force One and The Legend of Zorro. Does this Blu-ray lose anything from the Special Edition DVD? Yup. To my surprise, it omits a video commentary from Zwick and actors Morgan Freeman and Matthew Broderick. All of Zwick’s remarks still show up in his audio commentary, but the notes from the actors don’t appear anywhere in this set. Why drop the informative and interesting video commentary? I have no idea. Glory is a solid effort that tells an important story in a compelling and evocative manner; Zwick usually does well with this kind of material, and Glory is no exception. The Blu-ray offers very positive picture and sound plus a nice array of supplements. 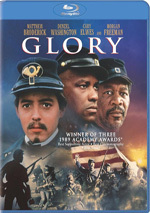 I felt very pleased with this Blu-ray edition of Glory and recommend it to fans.